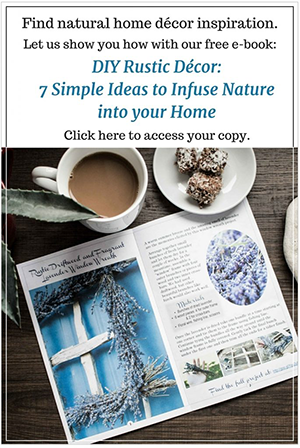 It’s hard to believe that we’re already in week 4 of our cottage bathroom renovation. 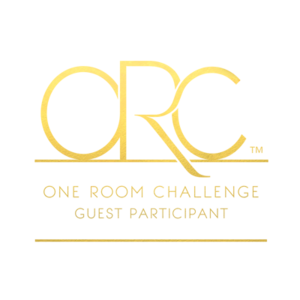 I guess it wouldn’t be called a One Room Challenge if it wasn’t in fact a challenge. And although we’ve been working away at the projects as best we can given that we are two hours away (yep, this distance thing being the biggest challenge by far), we still have so much to do! 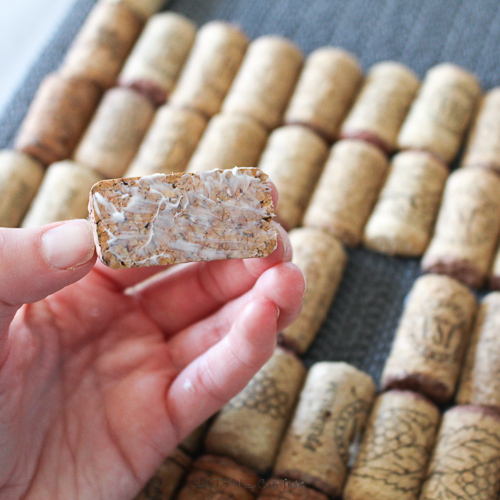 This week we tackled a DIY bath mat using wine corks! We’re no strangers to using wine corks in our projects, such as this Sparkling Wine Cork Star we made not too long ago. 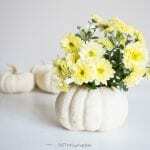 As for the bath mat, we wanted to create something that was earthy and rustic. 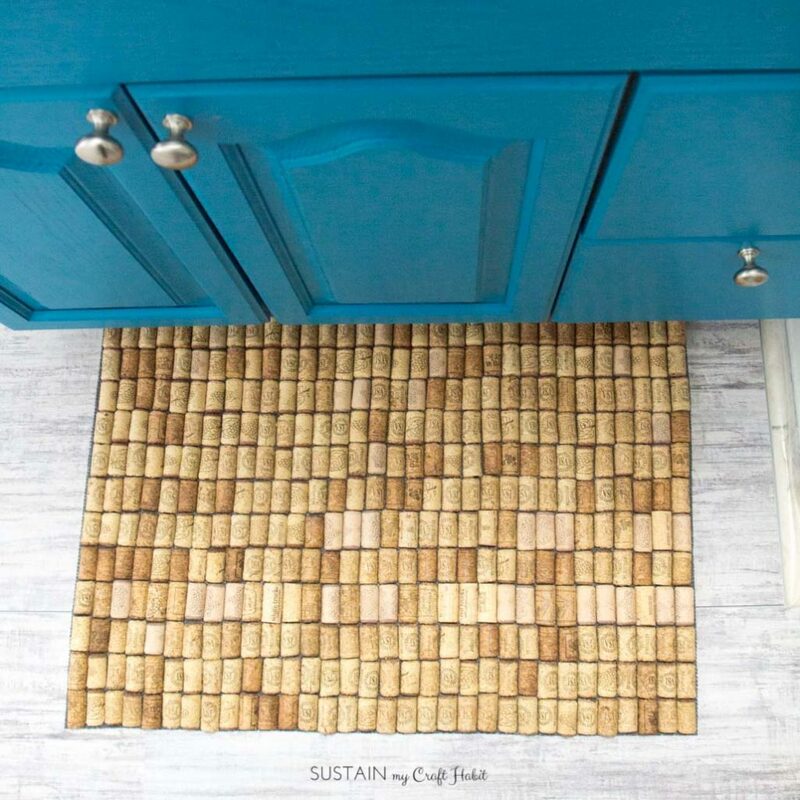 We came across this wine cork bathmat idea from Crafty Nest and decided to give it a try as part of our coastal bathroom makeover. 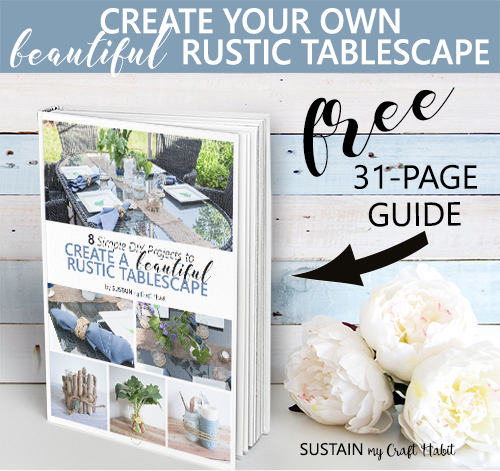 Check out her DIY for plenty of great information and helpful tips! 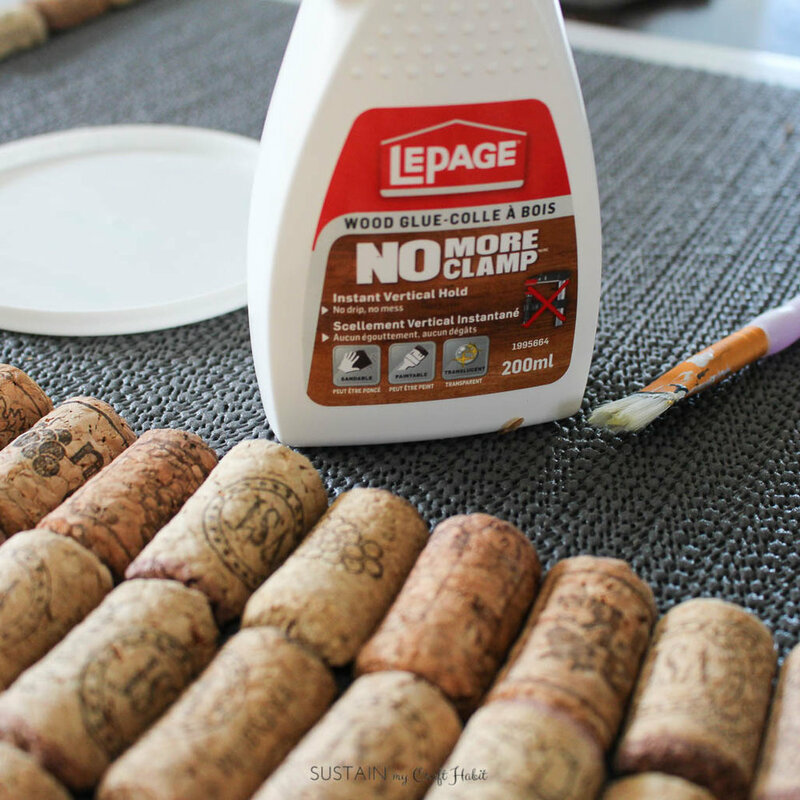 After testing out a few different adhesives, we decided to use LePage White Wood Glue to apply the corks. For your reference, we also tried using Gorilla Glue, a hot glue gun with clear glue sticks, and Yellow Wood Glue but after a 24 hour curing period, we found the LePage White Wood Glue to be the most durable in this case. So decision made, white glue it was! Corks are very difficult to cut. 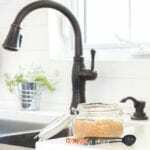 In order to cut corks with ease, boil handfuls of cork at one time and remove from water just before you cut. 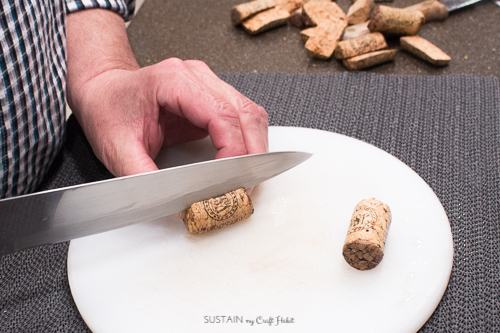 Place the boiled corks on a wood cutting board over a non-slip surface. Be very careful when handling the hot corks and when cutting. Hold the cork firmly in place and cut in half lengthwise. Put aside and let dry fully before moving on to next step. Continue until you have enough cut corks for your bath mat. 2. 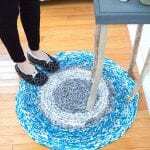 Prepare your nonslip bath mat base. 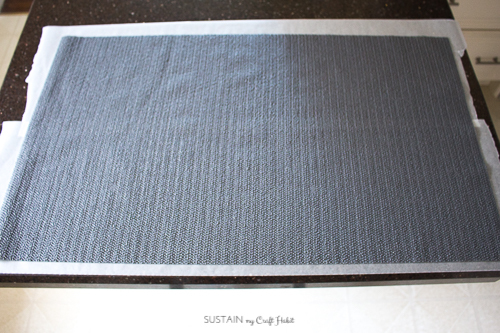 Cut the nonslip liner to a size slightly bigger than your finished bath mat. Place it overtop of wax paper. 3. Positioning the wine corks. Once the corks are fully dry, begin to place them over your nonslip liner. Align the corks in a row by size. 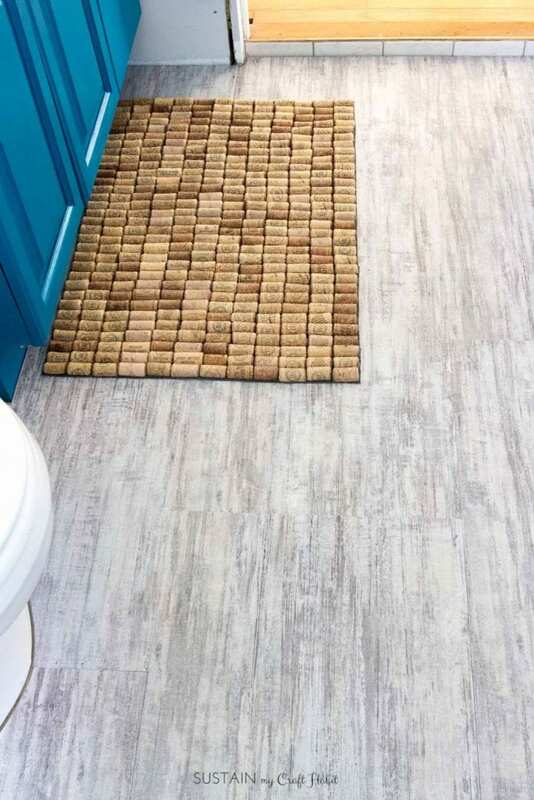 Place one row at a time and occasionally measure the lengths and widths throughout to ensure your cork bath mat is still evenly shaped all around. 4. Adhering the wine corks. Using a small paintbrush and wood glue, brush the wood glue to the cut side of the cork and press firmly into place on the liner. Hold firmly in place for 5-10 seconds before moving on to next cork. Work one section at a time and place a heavy board on top until corks are sealed well to the liner. The wood glue typically takes 24 hours to cure fully. Tip: Take it from me and avoid rushing the glueing process. 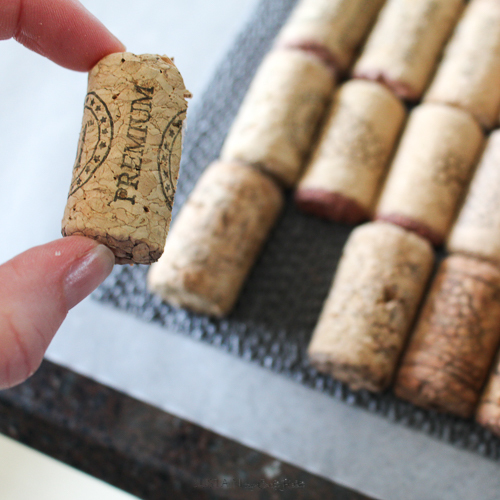 Take your time to ensure each cork is adhering well. After 24 hours of cure time. double check that all the corks are secure. If not, remove or lift up loose corks and apply more glue. Repeat step 4 for each loose cork. Once completed, peel away the wax paper and trim away the exposed liner edges as close to corks as possible. 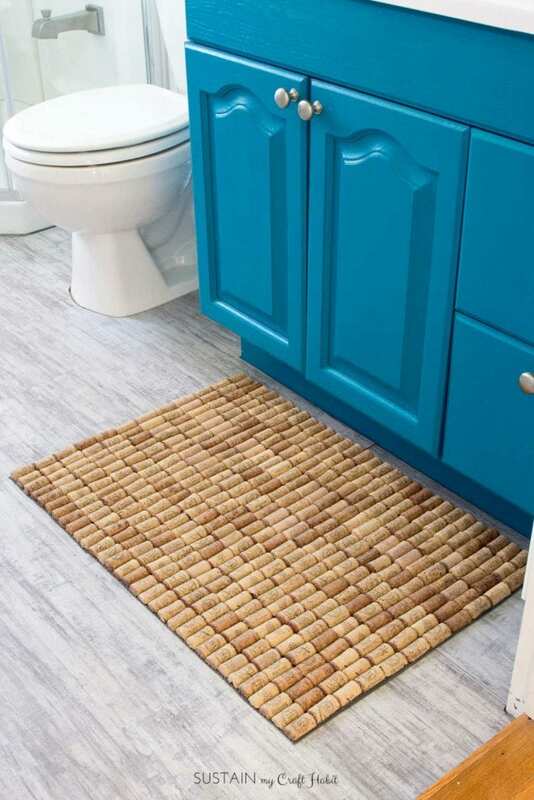 Place your new wine cork bath mat on the floor and enjoy! The bath mat looks amazing on the new Allure ISOCORE brushed white plank vinyl flooring we received from the Home Depot Canada for the bathroom remodel. 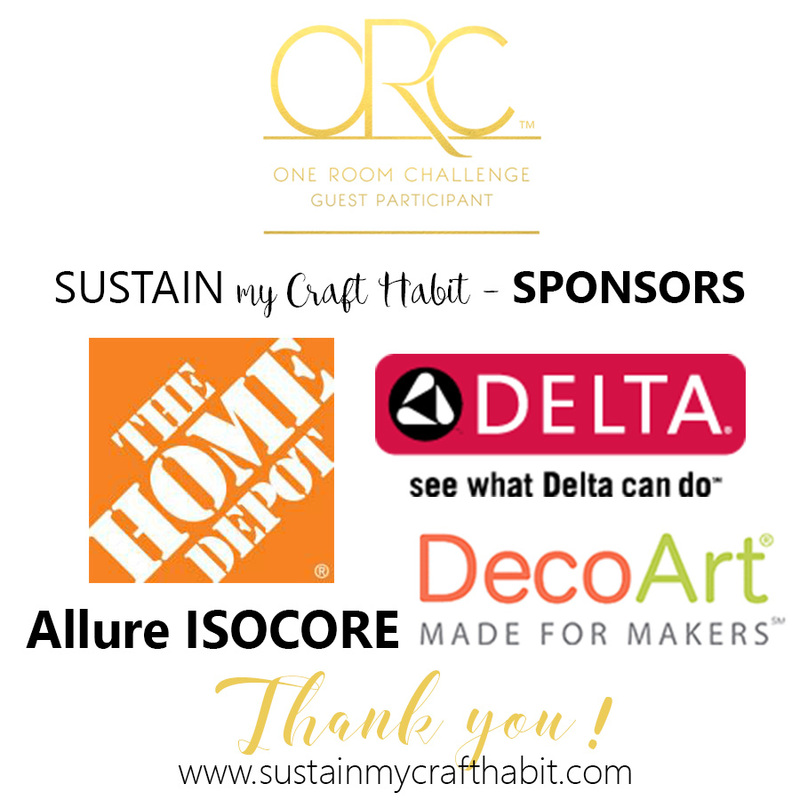 You can check out our full tutorial, including video how to install the Allure ISOCORE floor. If you haven’t had a chance to check it out, you can find the entire completed beach themed bathroom makeover here! 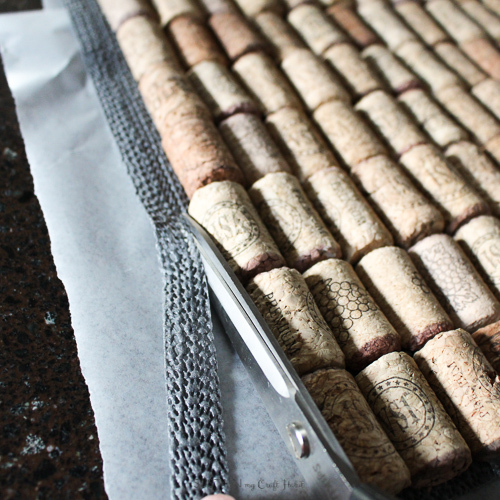 Have you ever tried or considered making a wine cork bath mat? 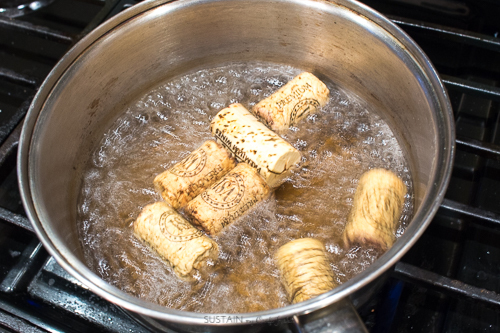 great tip about boiling the corks to make them easier to cut. Good luck with the challenge! Thank you Alana! Boiling the corks made all the difference for cutting. It’s surprising how difficult they are to cut otherwise. 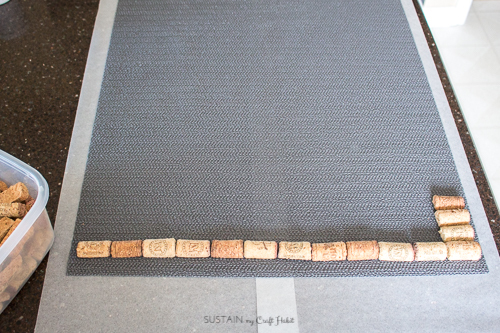 Your cork mat is really cool! I’m looking forward to seeing your bathroom reveal. 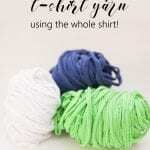 Thank you Joann! It’s actually feels very cushy for the feet. What is it like to stand on? I have hundreds of corks to make into fun crafts.